Minnesota’s Adrian Peterson ran for 212 yards on 24 carries to help keep the Vikings in the playoff hunt with a 36-22 win over the Rams. 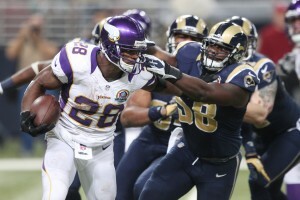 Peterson has a career-best 1,812 yards rushing, leaving him 294 shy of breaking the mark of 2,105 set by Eric Dickerson of the Los Angeles Rams in 1984. He has two games left, at Houston and home against Green Bay to top Dickerson. The Vikings (8-6) scored 10 of their 23 points in the second quarter off turnovers by Sam Bradford, including a 29-yard interception return by defensive end Everson Griffen. The Rams were down by 26 before Bradford threw touchdown passes to Danny Amendola and Lance Kendricks in the fourth quarter.